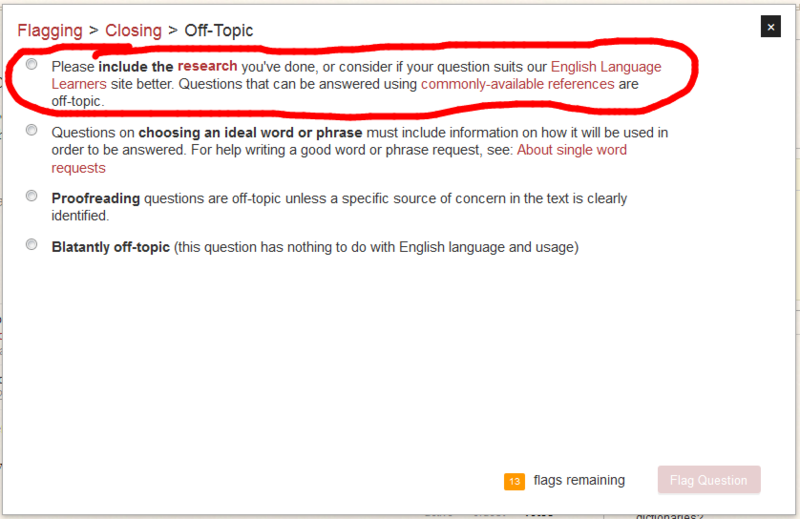 Quite a few questions written by English language learners (ELLs) are mistakenly posted on this site. I sometimes see riddles, or criticisms, or flippant remarks posted as comments below the question. I'm imagining a sole language learner at a dinner table, with the native language users sometimes tossing quick, funny asides to each other back and forth that you aren't expected to try to follow. He might wonder, What are they laughing about? Does it have anything to do with my language blunders? I'm uncomfortable when this happens, because the quips are sometimes funny, but they also make me squirm, because I've been the sole language learner at that dinner table. Q2. Could a flag reason be added, to the effect that the question would fit better on ELL? If that isn't possible, I'd like to ask that folks try to remember (or imagine) what it feels like to struggle to express yourself in a new language, in a way that others will understand and not laugh at. There is already a flag reason which mentions closure and migration to ELL, but it may take a little bit of finding. Migration to ELL is a closure reason. 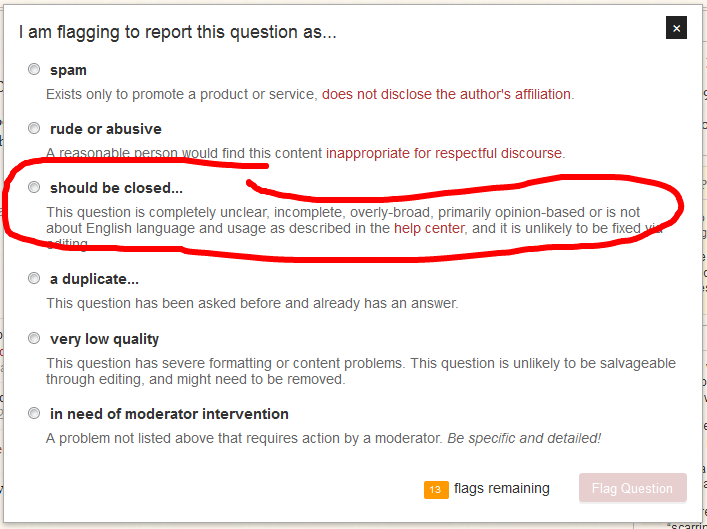 It appears in the standard close dialogs which are accessible when you reach a reputation score of 3000. But until then, you can still flag for migration. The only difference is that there is a distinct "Migrate" option — but that only allows users to suggest migration to Meta, not to another non-Meta site like ELL. You have to use the first reason, which does explicitly mention ELL. Not the answer you're looking for? 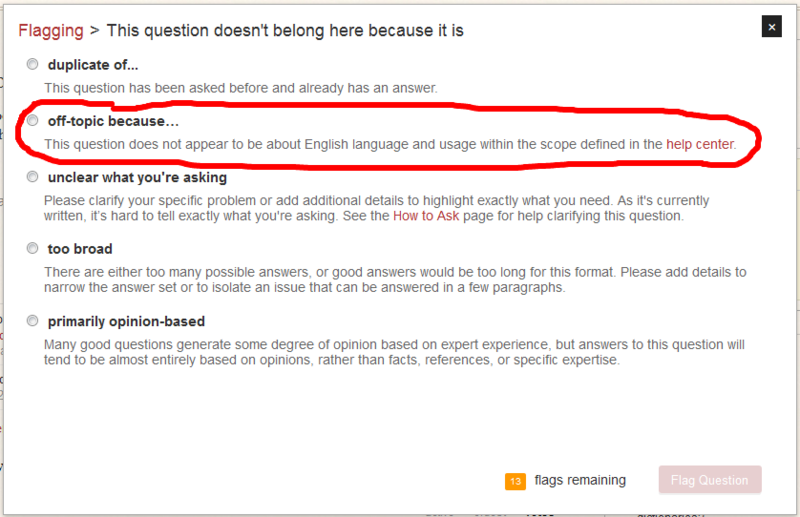 Browse other questions tagged discussion status-bydesign flagging ell etiquette . Should my name be appearing when I flag a question, and it is closed? 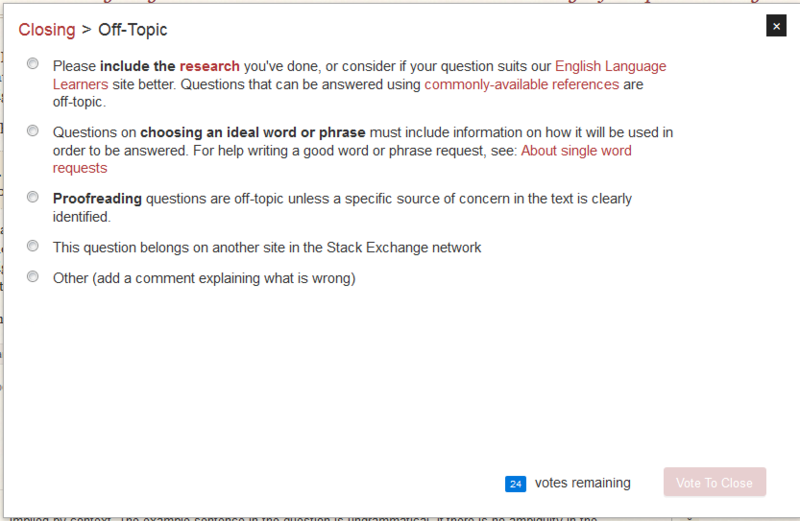 Should this ELL question be migrated to ELU? Should this question be migrated to ELL? Add new reason to flag answer: Adds nothing to answers already given?